Recap what Occam’s Razor is by reading my previous blog post on this principle. The principle has habitually failed to live up to it’s promise as a guide for choosing the right scientific path. Here’s why. Occam’s Razor tells us to choose the simplest explanation with the fewest assumptions. And before you think that Thor is an improbable assumption, then realize he would be but one assumption as compared to a huge amount of assumptions at play in our current physical models of the weather and the universe at large. Applying the “scientific” principle of Occam’s Razor, we should perhaps have stayed with the Gods. Eh, it got off on the wrong foot. 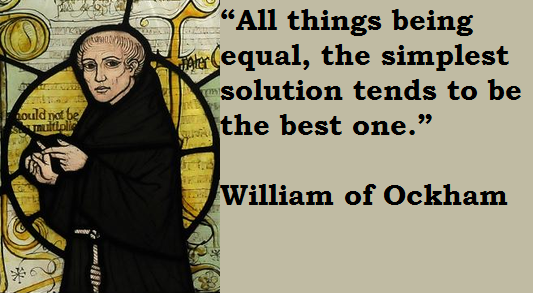 Occam’s Razor is not a scientific principle but rather a preference, and indicator. Remember that it begins with the caveat, “All things being equal.” Wild conjecturing of gods, though simple, is not scientific. It was still fun to discuss. It is used as a scientific principle – yes, a guiding principle. And your opinion that calling upon a God is not simple is merely an opinion if not supported by fact. What is clear however is that our knowledge of the universe we live in is very, very, very complex and by being so demonstrably complex, it really lends very little credence to Occam’s Razor’s value as a guiding principle. To me, it’s more scientific to view “complex physical processes represented with unfathomably complex weather mathematics at play” – not to mention the even more unfathomable complexity of the universe as a whole – to be the design of an intelligent Being(s), i.e. a guiding principle “of nature,” than to consider it to be mere chance. Whether this is Ockham’s Razor or not. What is it that is eating at you about Occam’s Razor? And who uses it to prove the existence of gods? This is not an example of “all things being equal.” Occam doesn’t say the simplest conjecture is the best. Occam’s Razor is a tool to move understanding along, not a tool to allow things to go unexplained in the scientific sense. The guiding principal is “why do with more what can be done with less?” Purveyors of this philosophy in modern times include Alan Turing, Benoit Mandelbrot, and Stephen Wolfram. Each has shown that much can be done with little and that complex systems can be built upon simple rules. Your assumption that the complexity of the universe must need to be explained in a complex way is not necessarily true. There is no unifying complex formula which brings all parts together, Therefore, the jury is still out on that unifying theory. Another assumption is the word complex. Complex is a human abstraction and a placeholder for that which we do not understand. Who among us who very well understands something then calls that understanding complex? No, when understanding dawns, the first words are something like “oh how simple it all is.” My opinion is that complexity is an abstraction which is brought about by enormity. When we cease to be able to follow the sequences of a process and then call it “complex,” that comes about because of not having sufficient synaptic construct to keep up with the steps — because of large quantity and lack of an ability to perceive. But not because of complexity. The concept of god is simple, lazy, and thought stopping. Why do we do that? Is it because it is uncomfortable to run out of RAM? I thought I understood the point of the post did but I don’t. Either of them. Maybe you could spend a minute elaborating what you want to communicate about how it didn’t work for you, etc.,. Actually, I very much enjoyed your piece, Geir . . The reason being is that I see too many pseudo-scientists spouting the use of Occum’s Razor as though either great wisdom or a wonderful solution. Thus your exposition above is very sensible. And, while I am on the topic of pseudo-science . . . let’s have a look at an item of “standard” science to have a laugh at. 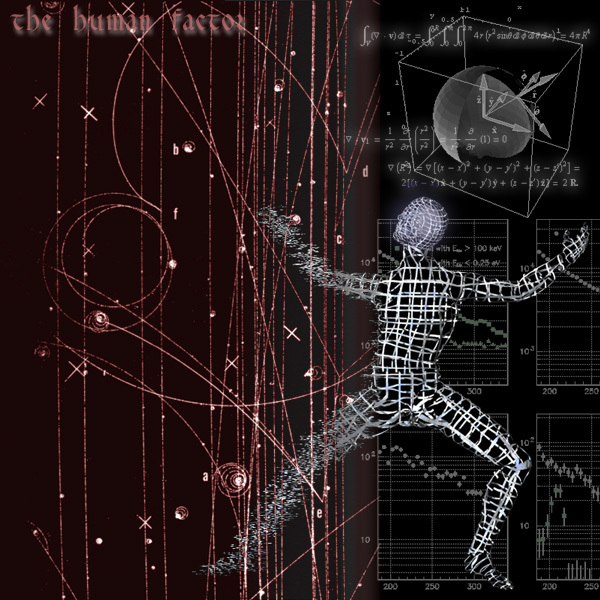 As we all know at around the beginning of the 20th century, there was greate debate amoungst scientists engaged in the study of the physical world regarding the validity of “theoretical physics versus experimental physics” in research . . . . Theoretical physicists are those guys who sit about thinking up ideas about what is, but do nothing to test by experiment whether or not their “think” is workable or real . . . The part that pertains to all the above relates to the thinking and research carried out by two “great thinkers” of the early to mid-19th century. Nicolas Léonard Sadi Carnot and Rudolf Julius Emanuel Clausius . . .
Well, there is a ditty about Carnot (pronounced carKNOW as in toe . . . he was a Frenchman, and you know how they pronounce ballet). Carnot researched the efficiency of steam engines and the use of heat as the energy/power source. As an engine that simply won’t go! I kid you not. . . this per the Professor at CalTech in the course above. In any event, our friend Rudolph came along a decade later and chewed further on Carnot’s ruminations with the result of coming up with a notion he called “Entropy” . . . which with further theoretical rumination lead him and science to the conclusion that things are winding down and that we face, or are experiencing “the heat death of the universe”! That is, they say, we are running out of energy and all will just flop to a standstill . . . .
Well, OK, that’s a lot of heavy thinking on the subject of ENERGY . . . And you all know how we feel about energy . . . valuable STUFF. Hell, around the beginning of the 20th century science was demonstrating (they think) that energy is the STUFF that makes up the physical universe. Well, OK . . . ever gone into a science dictionary and looked up this stuff called energy to see what they know of its composition, of what it composed of, made of . . . like what IS it? Well, the best these deep thinkers . . . and maybe it is the result of Mr. Occam’s wisdom of taking the easy way out . . . science’s definition of energy is: the ability to do work. They describe lots of perceivable effects of it, but have no clue as to what actually IS it, like what is the STUFF of it. Hmm, err, didn’t a fella with the initials LRH think that’s all his recruits were good for? ?